One of my favourite book shops is Books for Cooks in Melbourne . Here they have an excellent selection of current titles and a huge and diverse collection of second hand books. Tim knows his stock backwards, the staff are cheerful and helpful and altogether it is a great place to browse and potter about – very hard to visit without purchasing something. 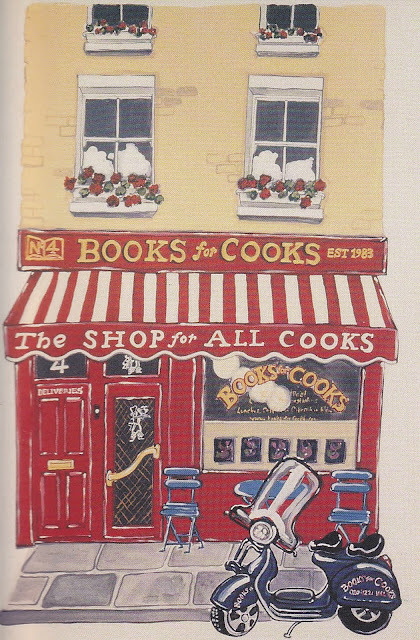 The London Books for Cooks was a little disappointing by comparison – a tiny space which for some reason seemed much more intimidating. And there were no second hand books! What the Notting Hill establishment does have however is a programme of workshops (held upstairs) and a miniscule café at the back of the shop. The café is their ‘test kitchen’ where the recipes from the books they sell are prepared by one of their resident chefs and then tried out on the clientele. On the day we were visiting there was a rush for the tables at lunch time – first in best fed, although the eaters appeared rather too sophisticated to actually push one another out of the way. The combination of books and food isn’t the novelty that it used to be and the idea that shop which specialises in books about food should actually also sell food seems so obvious that it’s incredible it doesn’t happen everywhere. And indeed it does happen even here in Sydney – the Book Kitchen in Surry Hills for one. What was so appealing about the Books for Cooks approach was that they were using recipes from the books they had on the shelves. If you really enjoyed your slice of Hugh Fearnley-Whittingstall’s Chocolate and Chestnut cake you might just feel inclined to purchase The River Cottage Year. Alternatively you could always take home a copy of Books for Cooks 9 the latest collection of the most popular recipes from the test kitchen which would also introduce you to recipes by Maggie Beer, Bill Granger and Greg and Lucy Malouf – perhaps not so surprising since almost all the Books for Cooks cooks are from either Australia or New Zealand. Surely the best way to evaluate any recipe book is to cook from it. Unfortunately the average purchaser has no access to sampling before they buy. Doesn’t the potential buyer want to know whether the recipes actually work? Perhaps not. These days so many books are more photograph than recipe any way perhaps it doesn’t matter how well the recipes are written or how well they have been tested. Since it is unlikely that the average celebrity chef who is travelling the world opening restaurants and attending book signings has written all or indeed any of the recipes which appear in their books we can only assume that someone somewhere is doing the hard yards. 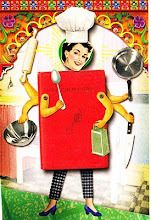 Which brings me to one of my perennial gripes – why don’t newspaper and magazine reviews do justice to recipe books? All too often the ‘review’ is a mere paragraph of publicity blurb rather than a thorough evaluation. The illustration at the top of this post is a post card of an original oil painting by Selina Snow.